SAN MARINO — The Huntington Library, Art Collections, and Botanical Gardens will host the California Bonsai Society’s 62nd Anniversary Exhibition at The Huntington’s Brody Botanical Center, 1151 Oxford Rd. in San Marino (www.huntington.org), on Saturday and Sunday, March 23-24. John Naka’s masterpiece, “Goshin,” at the National Arboretum. The show will be open to the public from 10 a.m. to 5 p.m. each day. More than 50 bonsai will be featured as well as some viewing stones. The bonsai have been styled by the society’s members, some over many decades. The best of Southern California bonsai will be on display. On Saturday, John Naka’s forest planting “Goshin 3” will be reassembled with Jack Sustic, former National Bonsai Collection curator and friend of Naka, leading the replanting. “Goshin 3” was Naka’s recreation of his Goshin forest planting, by far the most famous bonsai in the country. The original is the premier bonsai in the North American Collection at the National Arboretum in Washington, D.C.
On Sunday between 11 a.m. and 1 p.m., a bonsai creation demonstration will be put on by past president Lindsay Shiba. Members will be available to answer questions. Literature on bonsai will be available at the show and in the Huntington’s bookstore. The California Bonsai Society is a nonprofit organization that consists of professional instructors and advanced students. It was formed in 1950 and incorporated in 1962 under Naka’s presidency to ensure the continuation of this special art. 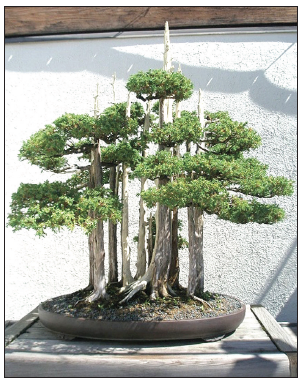 CBS is one of the most influential bonsai clubs in the country.